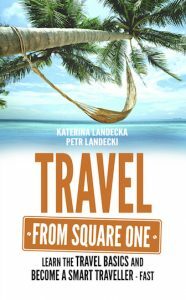 Our book TRAVEL FROM SQUARE ONE has been designed mainly for people who are new to travel but it might also by useful for experienced travellers. This guide book strives to set out in a simple way almost everything about organising travel – and even long-time travellers may forget (or have never thought of) some of the items included. We are currently finalising the book, it is going to be published in 2019. If you would like to be updated, please sign up for our free newsletter by submitting your email address below.